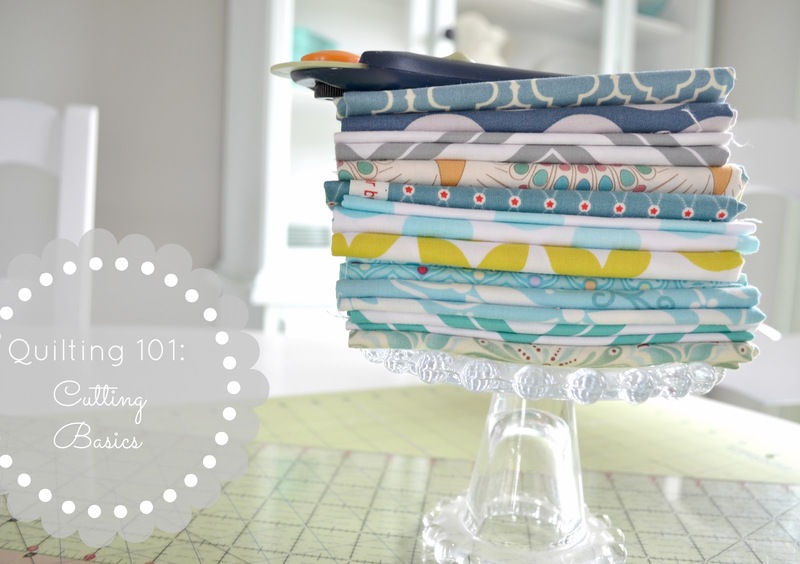 Welcome to Part Two of our Quilting 101 series. Today we are going to be covering the basics of using a rotary cutter. One of my college professors repeatedly told me "80% of your sewing success happens in the cutting room. If you don't get cutting right, you won't have a successful project." I'm here today to testify that her statement is very true and the importance of perfect cutting is essential in quilt making. Even being a fraction of an inch off on your cutting can make it so your project isn't pieced together perfectly. 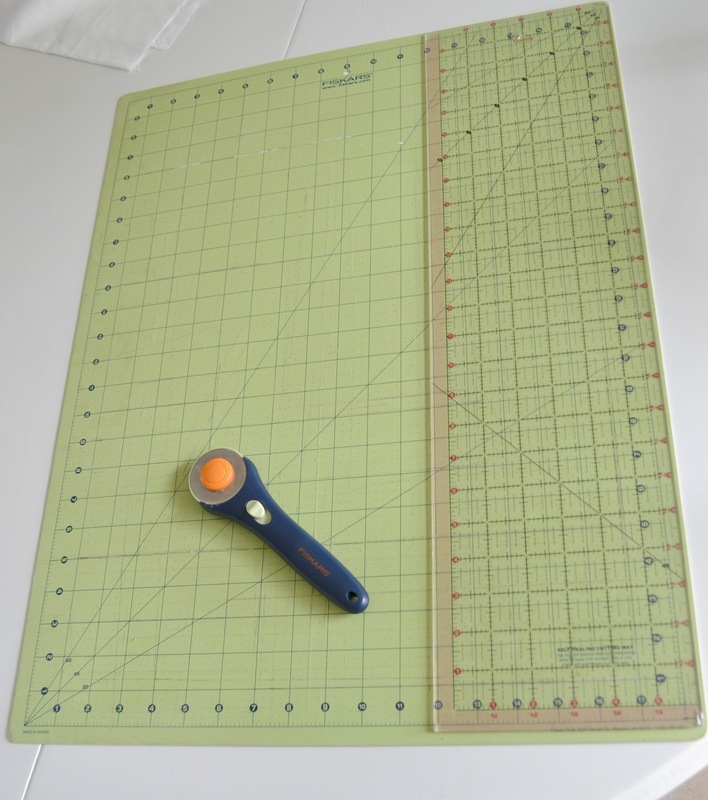 To start off you will need: a cutting mat, ruler, and rotary cutter. 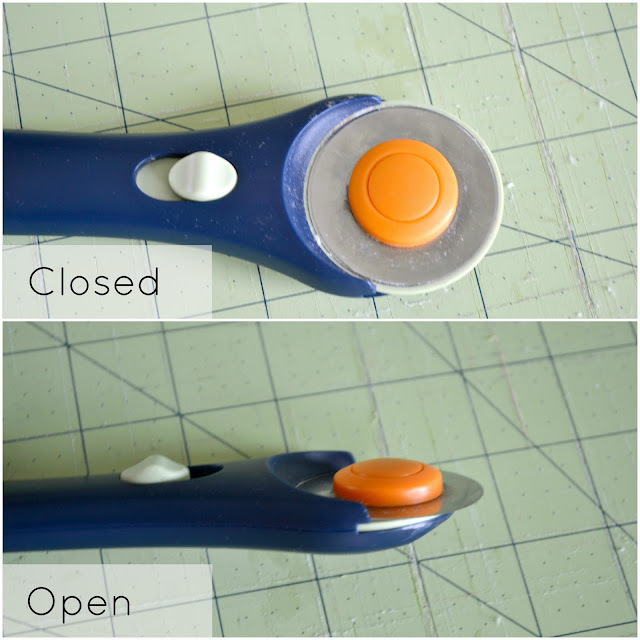 Olfa and Fiskars are the most popular brands and I have loved working with both. I am currently using a Fiskars set that was given to me as a gift quite a few years ago. Always make sure you have a workable, sharp blade. Using a dull blade can make it so you have to use multiple passes to get your cut, and can decrease the accuracy of your cut. Most blades have a simple lever that you slide to open and close it. Always make sure to close your blade as soon as you have made a cut. 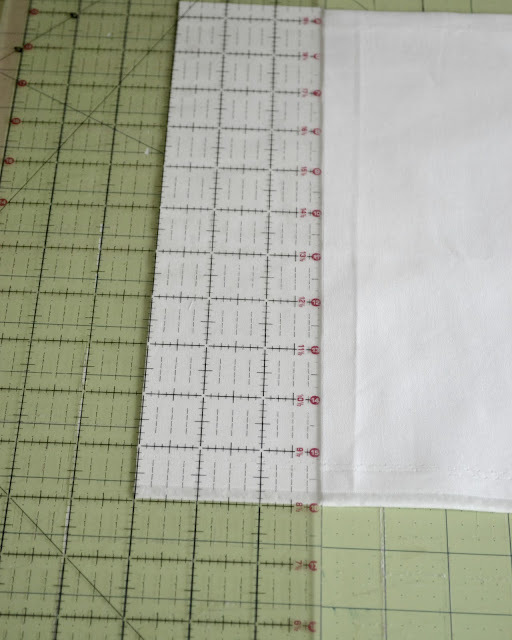 To start out, you will need to square up your fabric. You do this by folding the two selvages together. The selvage is the edge of your fabric that was finished by the looms in order to prevent raveling. It should look like this. 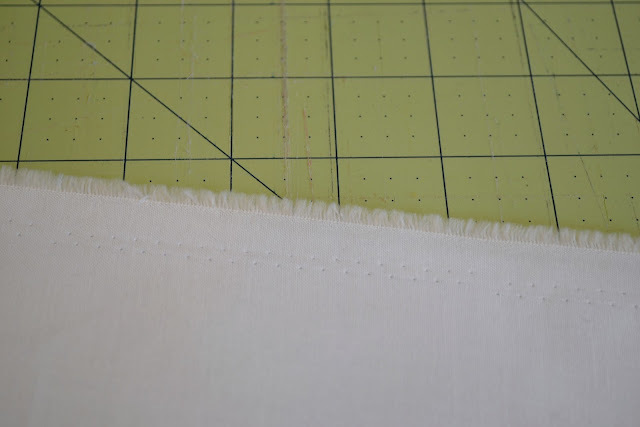 Once your selvages are together, smooth out your fabric to create your first fold. This fold is your first true square on your fabric. Selvages don't create a true square as they can be stretched and pulled as they pass through the looms. Line your fold up on a lengthwise grid and fold the selvage back down to the fold. Make sure to smooth out all wrinkles, but keep the selvage and fold lined up together. After you do this, you will probably find that your edges don't match up. That's ok, this is why we are squaring up the fabric before we start cutting our strips. 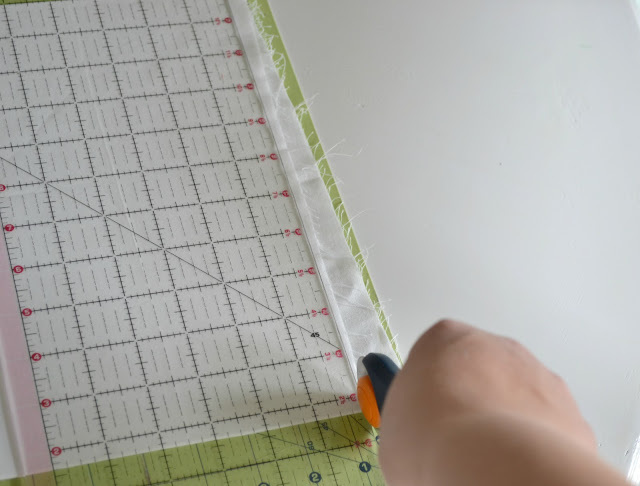 Keeping your fold perfectly aligned with the lengthwise grid, take your ruler and lay it on top of your fabric, running parallel with the side you will be cutting. 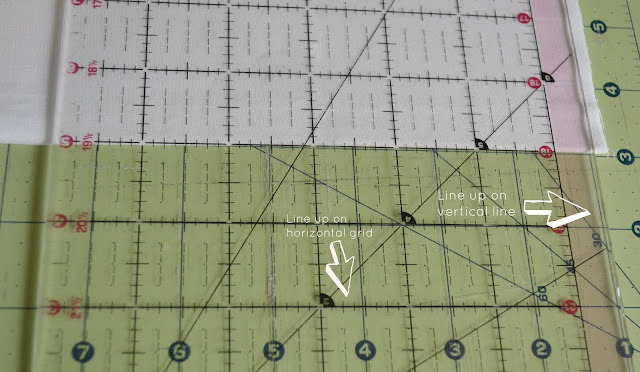 Line up your ruler on the line that runs vertical and then make sure it is square by matching up your horizontal lines. 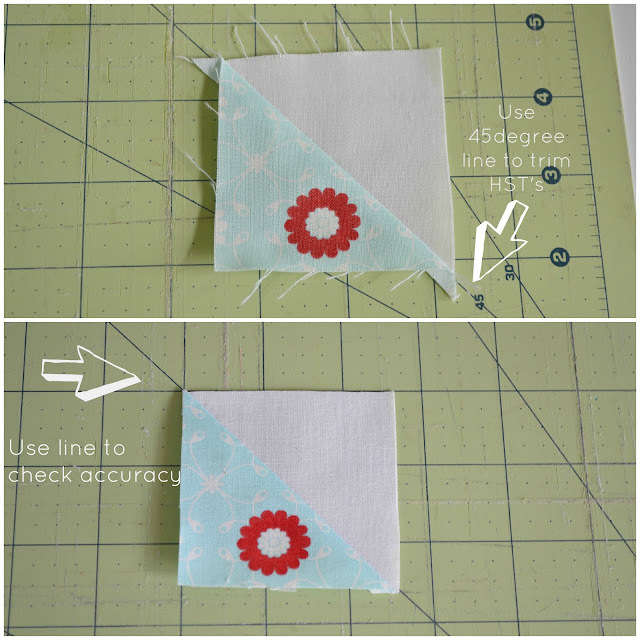 After double checking to make sure everything is square, place your hand firmly on the ruler (making sure not to slide the ruler so it isn't square) and use your other hand to cut the fabric. Starting closest to your body, and pushing away from you, make one quick cut. If your blade is sharp, you should only have to make one pass. Do NOT drag the blade backward towards yourself. If you find that you have to make another cut, do it with the same forward motion as the first time. Now that your fabric is square, you can start cutting your strips. As you can tell from the above picture, I was working on the right hand side of my cutting mat. You will now need to carefully flip your fabric so the square side is on the left had side of your cutting mat. For my project, I am cutting 3 inch strips. So I carefully lay my ruler over the square side until I have lined it up with the 3 inch mark on the ruler. I check to make sure I am square with both my horizontal and vertical lines and then I cut. Some of you may be wondering why I didn't just leave the fabric how it was after I squared it up and counted over 3 inches on my grid and then cut. The reason for this is that if I happened to slip while I was cutting, I would have cut into my strip and ruined it. If you cut your strips with the ruler completely covering it, then if you slip or make a mistake, the strip is fine and all you have to do is re-square up your edge. 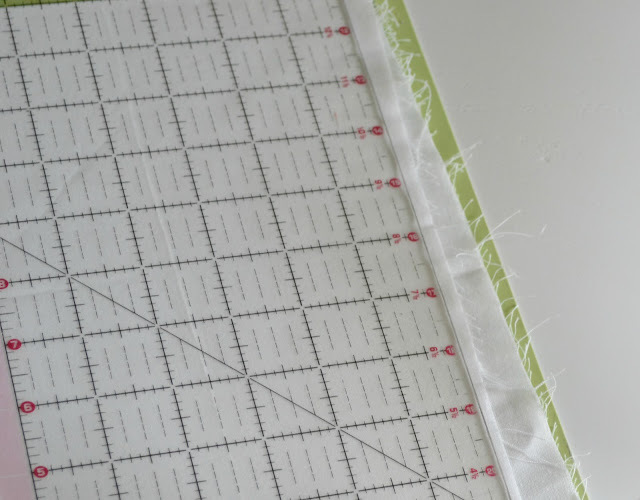 This really cuts down on wasted fabric because you won't have to re-cut another strip or be tempted to use a damaged strip because you don't want to waste the fabric. Once all of your strips are cut, you can then use the same method to sub-cut them into squares, rectangles, or whatever you need. It is important to make sure you don't fold your fabric up too much. The most I ever fold my fabric over is twice. 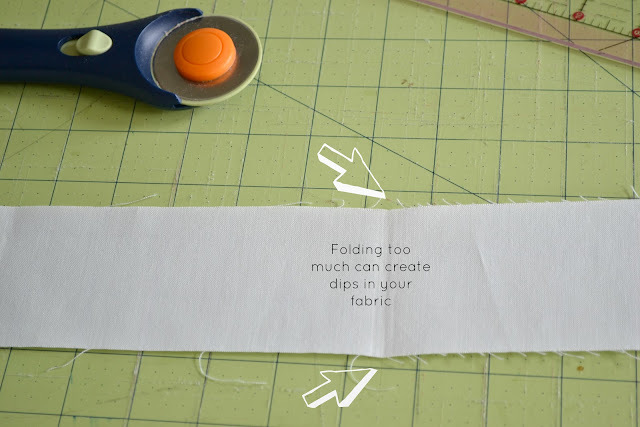 The reason for this is that the more folds you have, the more likely you are to get bunching, or have your fabric shift. This can result in you cutting a strip that looks like this. You may have noticed there are angled lines on your mat. Most mats come standard with 30, 45, and 60 degree lines. These can be used for a variety of things like trimming half square triangles (HSTs). I hope you found this post helpful! There are so many more things to do with cutting, but my hope was to cover the basics so someone who has never used a rotary cutter could pick one up and get cutting out their first quilt. Stay tuned for part 3 of this series, Basic Blocks: Half Square Triangles and Flying Geese.